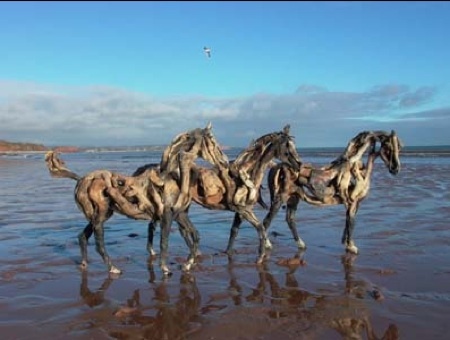 Horses made of driftwood. Not photoshoped but woodshopped. This kind of maniacal love (and why else would you do this?) makes my spirits lift. Despite its fragile appearance, each horse weighs three quarters of a ton and is free standing. Artist Heather Jansch has created almost 100 of these wooden horses, along with the occasional deer stag. Each stands at about five and a half feet. From an interview in the Mail Online. Q How do you fix the bits of wood together? A By whatever method works. I love solving problems and experimenting. Each sculpture is different. One needs to give a lot of thought to it and have an understanding of the stresses and strains created by different poses and some idea of the weights involved. The structure must not only be self supporting, it must also be stable enough to cope with high winds without falling over. Further, it must be strong enough to withstand being lifted by a crane to be positioned for exhibition. The larger sculptures require a steel frame. This is first painted with a rust inhibitor and then coated with fibreglass to give a roughened surface which both makes it easier to hide and stops the wood from slipping on bare metal. The wood is held in position for me to see and then tied with wire until I am sure it is right. Finally it is screwed together and the screw heads covered with filler and stain. Inevitably we miss one or two as people take great delight in proving.